I don't usually take on July assignments as I find it difficult to stay on top of them while traveling, and this July was no exception. Even keeping basic blog posts coming can be tough when we don't maintain a regular schedule and spend a least a day or two a week in the car. I appreciate the break, but now that August has arrived I have to get to work! At the beginning of the month I finished a fascinating book called The Address, by Fiona Davis. The Address follows two women - an English housekeeper new to the United States and an American interior designer fresh out of rehab - who lived a century apart but whose stories intertwine within the walls of New York City's posh Dakota apartment house. While not the kind of book I usually gravitate toward, this one kept me fully engaged from start to finish. I loved how the author created endearing but realistically flawed protagonists as well as satisfyingly agitating antagonists, and how she developed both sides of the story in a way that made sense and allowed me to transition smoothly from one to the other. Check it out! Later in the month I read I Am Number Four, by Pittacus Lore. My mom actually checked the book out at her library for Will, but I borrowed it late one night after he'd fallen asleep and then couldn't put it down. We may be walking past you right now. We are watching as you read this. We may be in your city, your town. You are saved as well. If we lose, all is lost. Will liked I Am Number Four too, so consider it a great read for boys and girls ages 11 and up! We didn't make it to the movie theater nor did I watch much television this month, but I did start a Canadian sitcom available on Netflix - Schitt's Creek - for which I expect I'll fall head over heels. I adore Eugene Levy and Catherine O'Hara together (have you seen them in Waiting for Guffman and Best in Show? If not, watch these movies NOW) and as an acting duo they are as sublimely paired as they've ever been in this comedy series. Before the kids head back to school we'd like to see Hotel Transylvania 3 (we loved the first and second installments in this film series), Jurassic Park: Fallen Kingdom, and Won't You Be My Neighbor? I also can't wait for Christopher Robin (I bawled my way through the preview), Alpha, and An Interview with God coming later in August. Though I almost deleted the podcast from my library after episode one, I decided to stick with Lake Clarity for a second episode...and have now finished two full seasons. The podcast is an original storytelling about five teenagers who, while on a celebratory weekend in the wilderness, discover the terrifyingly dark secrets kept by Camp Clarity. The first season revolves around the teens' experience, and without giving too much away, the reason I almost didn't keep listening is because they swear like I imagine five teens alone in the woods would: FAR too much. Swearing doesn't bother me in certain circumstances, but the characters take it to such extremes that at times I had trouble focusing on anything but their choice words. That said, the story intrigued me enough to continue listening anyway, and because season two revolves around backstory, tangent stories, and outsiders' perspectives, the swearing decreases to next to nothing after the first few episodes. 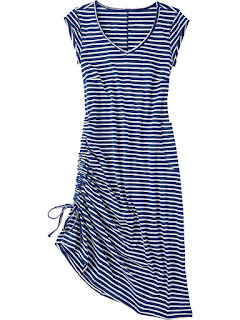 Navy blue and white stripes are my kryptonite. I enjoy black and white stripes and black/navy and white polka dots as well, but I seem unable to say no to any article of clothing that comes in a deep navy and crisp white stripe. I added two new pieces to my "collection" this month. First, the Drench Dress from Title Nine (one of my favorite stores to visit in Madison). It's comfortable and flattering, and comes in other colors in case you like the dress but don't love navy and white stripes as much as I do. 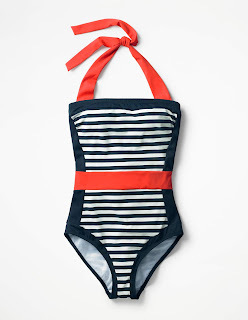 Second, the Santorini Swimsuit from Boden. Like the dress, this suit is comfortable and flattering, and I picked it up while it was on sale (it's not on sale right now, but hopefully it will be again soon) so I felt even better about my purchase. I have no affiliation with either Title Nine or Boden - I'm just a happy customer! 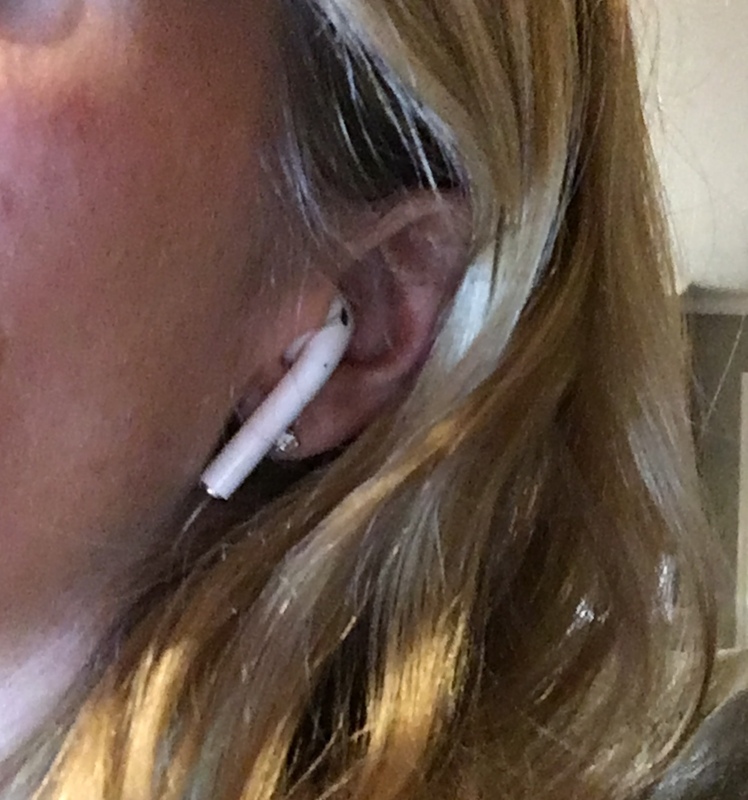 Tom bought me Apple AirPods (wireless earbuds/earphones) for Mother's Day. At first I didn't really want them - it felt like too extravagant a gift and I liked the pair I had - but when Tom's earphones broke, I offered him the pair I had been using (he really likes that style) and agreed to open the AirPods if he would set them up for me. As it turns out, setting them up is as easy as taking them out of the package and putting them in your ears - they connected to my phone the second I did so. As one would expect of Apple products, these earphones are easy to use, extremely functional, and "smarter" than any I've owned in the past. These earphones cost more than I think they or any version should, but if you wear earphones frequently I highly recommend this set. My mom taught the kids and me a new dice game called Quixx, and once we learned the rules and a little strategy, we played a round almost every evening. It's currently on sale on Amazon - give it a try! At the very end of the month I discovered this sparkling water, which for some reason I like considerably better than La Croix. Grapefruit tasted delicious but I'm looking forward to trying a few of the other flavors in August as well! Watching this woman learn ASL alongside her deaf son has motivated me to relearn some of the sign language I once knew and Will to start learning the basics. On a related note, this little girl hearing with her cochlear implant for the first time is so beautiful. Music is the best therapy. This deaf and blind soccer fan is able to enjoy the game thanks to his incredible interpreter, who uses a combination of sign language, body language, musical instruments, and a model of a soccer field to bring it all together.